The Import Chronicles – What is an Import? The Import Chronicles is a seasonal podcast series aimed at having an open discussion about topics specific to American Football Imports around the globe. As the host of the podcast, Perfect Pervis interviews various people involved in American Football in Europe, as they give informative answers and opinion. 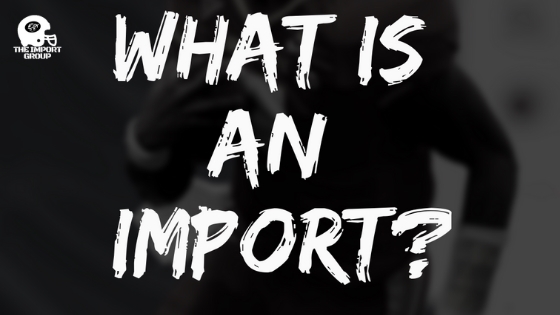 Today, the topic is What is an Import? Perfect Pervis interacts with his guests on the podcast, but has supplied his own answers to the questions asked during the interview, in written form below. I think it is very difficult to come up with a specific number for compensation. There are a lot of factors to consider in compensation. You have flights, accommodation & amenities, transportation, equipment, health insurance, sometimes food, and finally salary. All these factors must be considered when determining what is expected from both the team and imports. Then these factors will need to be adjusted to the economic differences as well. It is common knowledge that 400 euros spends different in Serbia compared to Switzerland. There is a difference in living in a teammates guest bedroom and having your own villa. Also, having a car in a metropolitan city is not the same as having a bike in a rural town. With so many variables involved, a fair compensation really depends on what the import and team want from the experience. Imports help the game in many ways, but I will just name a few that come to mind. First, imports naturally make the local players better through osmosis, all that knowledge and experience is contagious. Secondly, import presence increases the quality of the game on the football field, which in turn helps in recruiting more players, fans, and sponsors. Lastly, imports have a lasting effect on teams, whether good or bad, that they learn from that effect going forward. Is it possible to have any players who went from Europe to play in Canada or the U.S. talk about their experience, the process, and give advice to players from Europe that want to play in North America? Being an import has definitely taught me a lot coming from the U.S being able to immerse in another culture for me has been the greatest experience. Makes playing football that much better!